When Eber Baker founded Marion in 1822, a handful of Catholics lived in the area. By 1844, with a Catholic population of 100, Marion became a mission site and circuit-riding priests celebrated Masses in private homes. In 1854, the Huber Shop on Mill Street became the first permanent place of worship. On land purchased by Timothy Fahey in 1853, a new church was built and dedicated by Bishop Rosecrans. Before long, this building, measuring 70’ by 40’, could no longer serve the growing Catholic population and plans for the current church on North Main Street were underway. Built on land purchased by Father John Mackey, this magnificent edifice was completed in 1898. Constructed of Berean sandstone, St. Mary Church was built in the Victorian Gothic style. Like many churches, St. Mary has undergone several renovations and repairs. The most recent renovation took place this year under the leadership of Father Thomas Buffer. 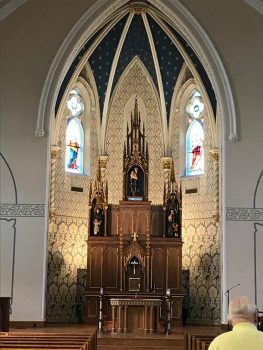 This beautification included remodeling and gilding of the raredos, moving the tabernacle to its rightful place in the center, adding new side shrines for the church’s original statues of the Blessed Virgin Mary and Saint Joseph, elaborate decorative painting in the sanctuary, renovation of the priests’ sacristy, and replacement the school roof. Along with the wish to create a beautiful place of worship for the faithful, the desire for education was ever-present. The first parish school opened in September 1875, also serving as the residence for three Sisters of Charity who taught there. A larger school was built in 1905 on Prospect Street and, in 1906, a new convent was built next door. By 1927, a new addition was needed on the school to meet the expanding Catholic population. St. Mary School, once the site of both elementary and high schools, continues to serve kindergarten through grade eight. The convent, now known as the Commons, is no longer the home of the sisters but provides office space for the staff and serves as a meeting place for parish activities. An open house was held Nov. 11 to allow the community to admire the new sanctuary. St. Mary Church is located at 251 N. Main St. The church office may be reached at 740-382-2118.